Bundle of Holding asked us to participate in their Halloween promotions, and when we saw what they were including, we just had to jump on board. Starting with the most important aspect, 10% of the money raised goes to the National Center forMissing & Exploited Children. This is an organization dedicated to fighting some of our world's most horrifying monsters. After that, customers can buy in at two different levels. 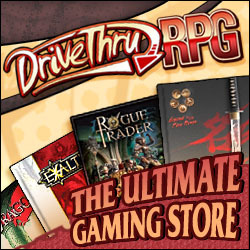 At the base level ($9.95), buyers receive PDFs of Savage Worlds Deluxe Explorer's Edition as well as The Horror Companion. (Conveniently, the two books required to play Accursed!) They also receive Silent Legions from Sine Nomine Publishing, a modern Cthulhu game with mechanics in keeping with the OSR movement. Buyers who buy at more than the threshold price (initially $19.95) receive a whole bunch more. First off, they receive Accursed. We're guessing you already know about that since you're viewing our site. They also receive Rippers and the Rippers Companion from Pinnacle, a brilliant setting that focuses on Victorian Monster Hunters. Finally, they receive Shadows of Esteren Book 1 Universe. This is a lavishly illustrated game setting of medieval gothic horror. The folks at Bundle of Holding tell me that there's still more coming, and I'm excited to see it. Buyers who join in now get anything that might be added to the bundle later as well. However, that threshold price for bonus books does go up over time, so if you want in, it's better to buy early. The base offer is $40 in books for $10. The bonus offer is $100 in books for $20. I don't think you can go wrong with either, even if you already have some of those books. Thanks for your attention, and please help us to spread the word about this great deal.